At the end of a private lane there awaits the cozy, beachy Casa del Sol. Experience the therapy of waking up and looking at the waves as they reflect the morning sun. Feel the cool ocean breeze and the hot sun. 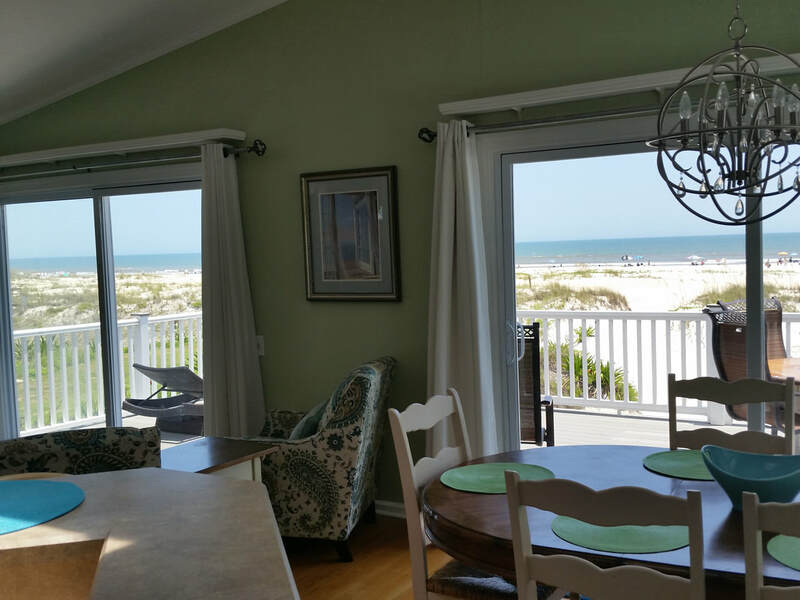 Dive into the sea, walk on the beach, or just sit on the porch. 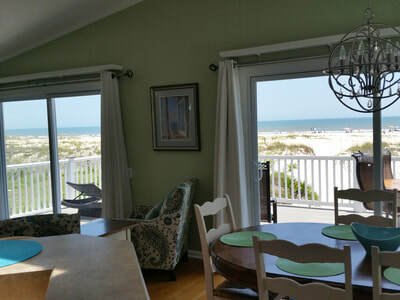 You can watch TV while looking at the ocean through the expansive glass doors. In the evenings, stargaze and dream. 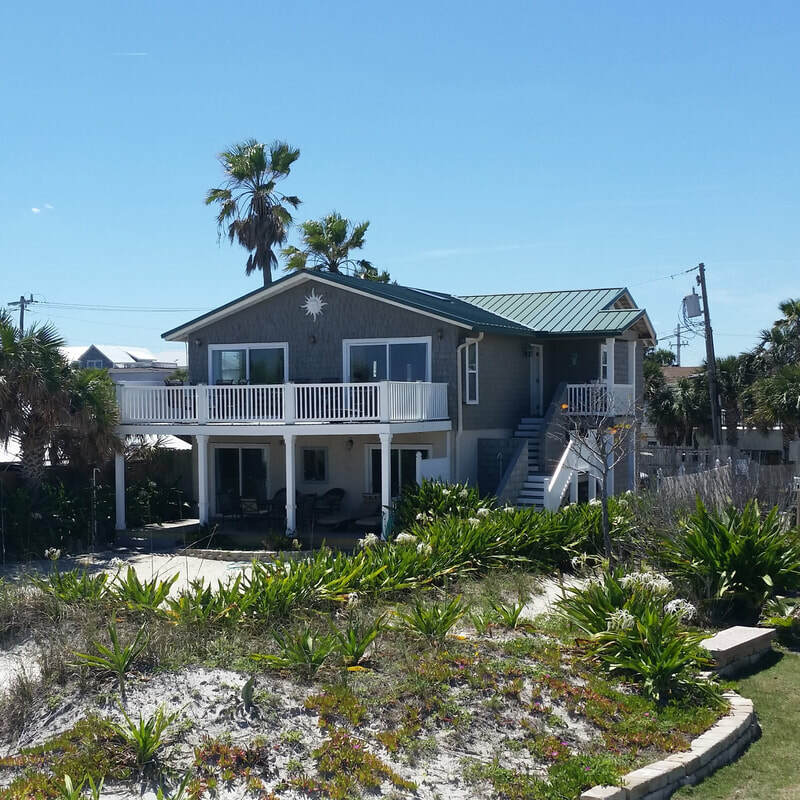 We have preserved the casual cozy feeling of our beach house while still giving you the conveniences you deserve. There are flat screen TVs in every bedroom and each living area has a large TV with DVDs and VCRs. We have games, books and water toys. Sit in the shady porches or out on the large balconies. We have a grill. If your budget is tight, cooking at home can save you more money a day than the cost of the house, so renting a house is a great way to save. The house is set up as so each level has everything you need. Large families can be together and still have some personal space. That means that each floor has 2 bedrooms- each with private baths, 1 powder room on each floor, separate kitchens, living rooms and dining rooms. Each floor accommodates 6 people easily- 8 if your family does not require a lot of personal space. The Beach level Home is called Island Tropics. Tropical greens, sunset yellows, palm trees, tiles, and stained wood furniture. Like the tropics, this level celebrates the shade as much as the sun and feels like an oasis from the hot sun. Sit on the porch and let the rest of the world do all the work. This floor is at beach level so you just walk out the back porch and your toes are on the sand. Its most recent addition is a massage chair because, you know, it can get very stressful laying on the beach all day. The Upper level Home is called Key West. Bright apple greens, sky blues, corals, white wood furniture and wood floors. This unit has skylights so you better like bright spaces. The show stopper, however, is its spectacular view. We have plenty of private parking ( which is rare for beach houses) and are located away from busy A1A. We have a no driving beach. This means unobstructed views and is also safer for kids. 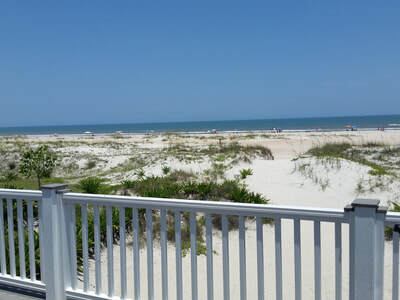 The beach is wide, flat and sandy- no cliffs or rocks like the beaches north and south of us. The oldest and (in my opinion) most romantic town of St Augustine is a 10 minute drive away. There is a shuttle that takes you back and forth. Be prepared to feel like you have stepped back in time to a town somewhere in Spain. Within 2 blocks.-Restaurants, spa, shops, surf shop and surf lessons, miniature golf, bike/surfboard/kayak etc. rental, a pool owned by a restaurant where you can have a drink, listen to music and watch the kids swim. 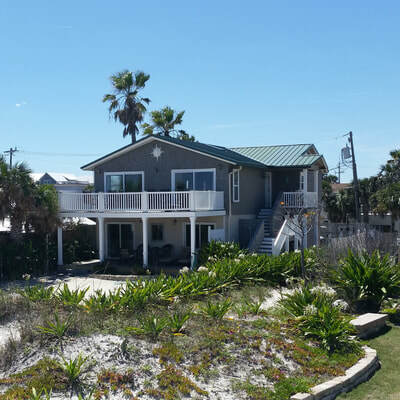 We want Casa del Sol to become your beach home that you return to as a yearly tradition. Where life slows down and you let your heart take the lead and give your brain a vacation. A place where you have many great memories of carefree times with family and friends. So we have one very important rule: When you step onto our porch, please leave your troubles behind -relax and enjoy.